This well-restored former fondouk – a place where traders took lodgings and stored and sold their goods during the 18th century – is now home to the Nejjarine Museum of Wood Arts and Crafts. Opened in 1998, the museum allows visitors to marvel at such artefacts as craftsmen’s tools, prayer beads, ancient chests, and musical instruments. Much care has been taken with regards to the presentation of the displays, and the building is almost an attraction in itself, although photography is now allowed. Displays are presented within an attractive inner courtyard, in rooms through intricately-carved wooden archways, and beneath cedar ceilings. The Nejjarine Museum of Wood Arts and Crafts is located in the picturesque setting of the Place el-Nejjarine (Carpenters' Square). Here you’ll find one of the medina’s best-known mosaic fountains, plus small alleys that lead off to the Nejjarine Souk, where carpenters still chisel, carve, and sell their cedar wood items. 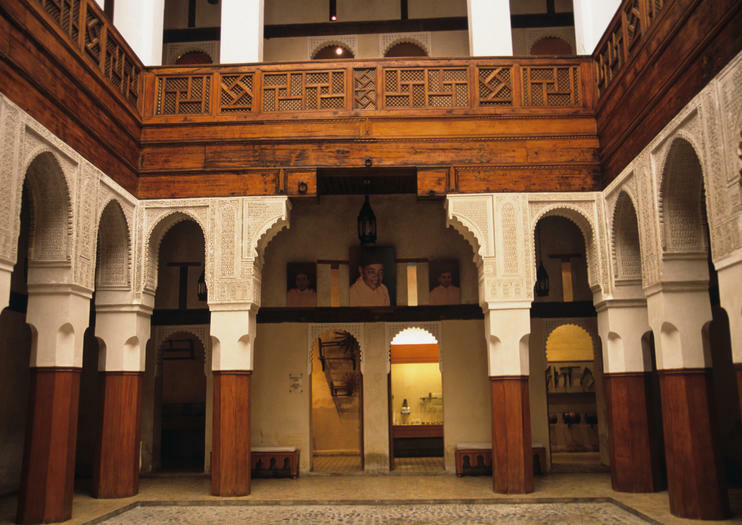 This museum is located on Place el-Nejjarine, which is easily found, although you may wish to use a guide to navigate the alleyways of the medina. The museum has a rooftop cafe with panoramic views over the medina. Don’t miss a chance to explore Morocco’s cultural capital on this 1-day guided tour of Fes. Walk the winding streets of the city’s car-free medina, a UNESCO World Heritage Site. Visit pungent tanneries and souks piled high with spices and handicrafts. See Bab Boujeloud, the Jewish Quarter, Medersa Bou Inania, Nejjarine Square, and the Batha Museum. If you wish, enjoy a Moroccan cooking class before your return to Casablanca.